We invite you to explore India - the Land with infinite beauty ! Whether you soar high into Himalayas or peer under the ruins of the Ancient monuments dotting the landscape of India, you will cherish the experience long after your visit ! This India Travel Guide on Santhome Basilica is free from any commercial interest! This site is dedicated to promote India - the vast subcontinent, its glorious past, magnificent landscape and its infinite variety. Santhome Basilica is at the end of Marina beach in South Madras (Chennai as it is known now). Santhome - eponymous with Saint Thomas - one of the disciples of our Lord Jesus Christ who was martyred in 72 AD - is the name of the location where this Cathedral was rebuilt in the year 1890. 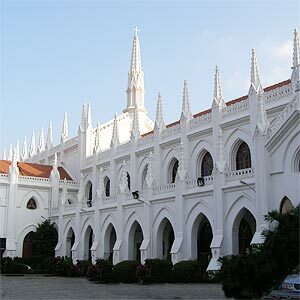 The Santhome Basilica Cathedral is built over the tomb of St. Thomas. A small hand bone of the Apostle as well as the head of the lance that was used to attack him are contained within. The statue of Virgin Mary enshrined within the Santhome Basilica Cathedral has come from Portugal. Brief History: Period: 51 - 72 AD: Saint Thomas - the doubting Thomas - lands in Kerala and spreads the Gospel. Mar Thoma or Thomas Church is started at this time in Malabar coast - Kerala. This part of South India under the Pandyan dynasty had well established trade with the west - Rome and middle east at that time. There is even a Jewish settlement in Cochin to this day. Part of the newly converted Christians remained as Syrian Christians even now in Kerala. After a few years, St.Thomas comes to Madrasapatnam near the present day Mylapore Madras. There is a legend associated with this first church of Mylapore in Madras. A hugh log washed ashore was blocking the narrow mouth of the river that caused floods. The army of the King could not dislodge the log despite their best efforts. Hearing about the divine powers of St.Thomas, the king requested Thomas to help. St.Thomas touched the log with the Girdle of Virgin Mary and when the King's men pulled the log, it came without any difficulty. The grateful King offered the place where the log was sighted to St.Thomas who constructed a small Chapel. Unfortunately after some time, local chieftains nearby came into conflict with the teachings of St.Thomas and they eventually killed him in the nearby hillock - which is now named as St.Thomas Mount. Tomb of Saint Thomas: The tomb was opened for the first time to take some earth to cure the son of the then ruling king - Mahadevan. Starting from the year 222 AD portions of St.Thomas' remains were shifted to Edessa in Asia Minor. Later it came to be reposed in a silver casket inside the basilica of San Thommaso Apostolo in Ortona, Italy. Santhome Basilica shares the distinction of one of the three Basilicas built over the tombs of Jesus Christ's disciples. St.Peter's Basilica in Rome (built over the tomb of St.Peter) and Santiago de Compostela in Galicia, Spain (built over the tomb of St.James). Santhome Cathedral: This Church constructed over the chapel in 1890, became a Cathedral under the Archdiocese of Mylapore, Madras. It was elevated to a minor Basilica in the year 1956. The Cathedral was built in the neo Gothic style and contains beautiful stained glass windows depicting the story of St Thomas. There are wooden plaques that depict scenes from the last days of Christ. With a steeple of a height of 180 feet, it also houses the relic of St.Thomas in the basement beneath the altar. Blood soaked earth and the spearhead that martyred St.Thomas is preserved below the Basilica in this basement. Credit card sized Relic cards containing minute earth sample of the place where St.Thomas was killed is sold here. Catholic Conference of the Bishops in India has conferred the status of National Shrine on this basilica in 2006.